Finally, a handbook written by both experts and the people you trust even more: your fellow admins around the world. Become a standout assistant with help from people who have been where you are. There's a gold mine of advice and information from office professionals just like you! Rush me The Admin Pro Handbook so I can overcome every challenge I face! I understand that I can review my copy risk-free. And if I don't immediately see how I can transform from surviving to thriving, you'll refund my entire purchase price. No questions asked, and I'll have no further obligation. On that basis, here's my order. Yes! Send me the guide that will help me thrive. Kara felt out of her league. Hired by a financial services firm as an administrative assistant, she found herself on day one asked to deal with a boss who was going to be out of the office four days a week, a team that seemed unstructured and falling behind the workload, and software applications she didn’t even knew existed. No one had much time to show her how to manage all these new, unfamiliar tasks – and no one was rushing forward to be her friend or mentor. What Kara needed more than anything on that second Monday at work was friendly voices to give her advice and support. And to hear those voices, she found herself reaching for a book. The best place to turn for help navigating the frustrations in today's workplace is other admins who have already overcome them. I want to know their secrets to success. Send me my copy of The Admin Pro Handbook now! 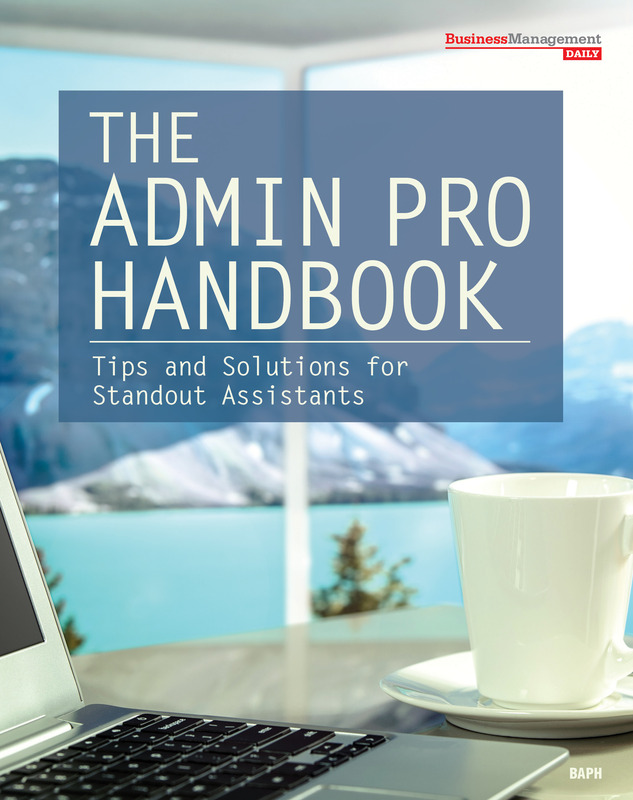 The Admin Pro Handbook: Tips and Solutions for Standout Assistants is filled with useful information for admins on time management, dealing with the boss, working closely with colleagues and achieving work/life balance. You’ll also receive instruction on office tech, business writing, delivering presentations, setting career goals … and yes, even minute-taking. But you’ll also be surrounded by sympathetic, experienced voices that make you feel part of the admin community, as dozens of real admins chime in with answers to the most difficult questions you’ll face at work. … tactfully organize your boss? … handle an unusually nosy co-worker? … best share documents with the staff? … train yourself to say, “No, I’m too busy”? We put these questions and many, many more directly to working admins, and we’ve collected their answers in The Admin Pro Handbook. What better advice could you possibly get? The nuts and bolts of being an admin are also covered extensively in The Admin Pro Handbook. Does minute-taking have you intimidated? The book includes a thorough guide. Grammar skills a little wobbly? It features several pages of writing and speaking tips. Could your tech skills use polishing? Flip to the 30-page section full of keyboard shortcuts and mini-tips spanning Word, Excel, PowerPoint, OneNote, Outlook and even Google Docs, all courtesy of Microsoft® Certified Trainer Melissa Esquibel. Self-audit: Are you keeping burnout at bay? Being an admin is a lifestyle, a story arc, a narrative featuring you as the hero. The Admin Pro Handbook prepares you for the journey with more than 200 pages of insight and guidance on everything from dealing with new job jitters to promoting your achievements to managing major projects. Take a tour of the book’s Table of Contents below, and then think of a question about your job and your career that you’ve been wondering about. You’re not the first to ask it, we assure you. And chances are, the answer is here. • Quiz—Self-Audit: How Well Are You Keeping Burnout at Bay? • Quiz—Are You a Micromanager? • When Confused at a Meeting, Speak Up! • Conversation Veers Off Track—Now What? Kara took charge of her career and her future. Now it’s your turn. Get your copy of The Admin Pro Handbook today! P.S. Remember, there’s absolutely no risk. If you don’t see how you can transform from surviving to thriving, we’ll refund your entire purchase price – no questions asked – and you’ll have no further obligation. Order your copy of The Admin Pro Handbook and take charge of your future … today!